Welcome! I am one of the world's top travelers. • See the Wikipedia article: Don_Parrish_(adventurer). • Completed Visits to all 193 UN Member Countries (1957 - 2011). • Listed in the top category of the UN Masters List on NomadMania.com. • First to complete the 266 country UN+ list on NomadMania.com on 10 Feb 2017. • Completed the Travelers Century Club's list of 327 countries. See the TCC Award. • Ranked #1 in the world on MostTraveledPeople.com since 2 Nov 2013. • Winner of 2018 Champion of the World traveler award from ETIC. • Essay: Who is the World's Most Traveled Person? • See my travel history and rankings. 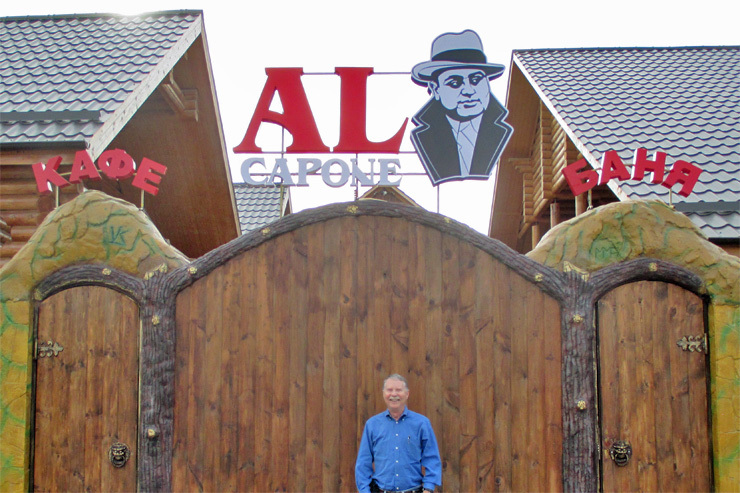 Interview in the Daily Herald on 6 June 2014: Downers Grove Man is Most Traveled. The YouTube video by the Daily Herald is a fun summary of some of my travels and my perspective. 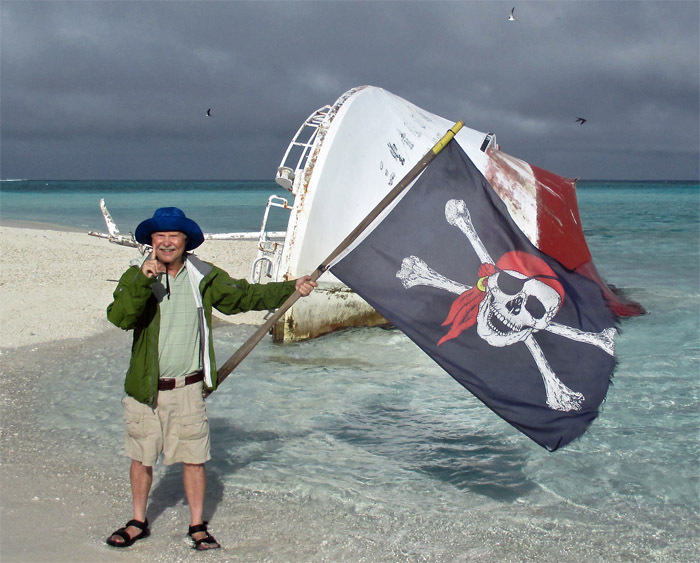 My interview published 9 December 2014 in the Best Travelled Newsletter, now Nomadmania.com. 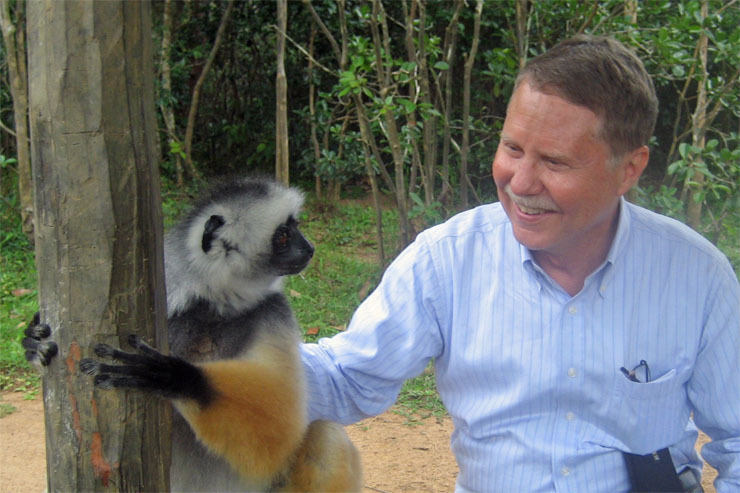 In 2015, I was one of 34 Top Travelers who have visited all countries interviewed for the book Chasing 193. On June 1, 2015, BBC Travel named me as one of their six Travel Pioneers for 2015. On June 15, 2015, Charles Osgood, the long-time CBS reporter, had a radio commentary on my travels. On September 9, 2015, my interview published in Polish was on the home page of www.onet.pl. Emirates Airlines magazine featured me in an informative September 2016 cover story. Check it out. Award-winning Die Zeit portrait published in German and English November 2016 to March 2017. Most Traveled Person story in Chicago Tribune on the Internet and in Print January 1, 2017. Published in Vietnamese by http //news.philoan.com.vn How to be Most Traveled. World's Most Traveled Man story in the DailyMail.com on November 24, 2017. World's Most Traveled Man story in The Sun on November 25, 2017. World's Most Traveled Man story in The New York Post on November 27, 2017. Most Traveled Interview thepaper.cn (Chinese + translation - pdf of 3 megs) January 10, 2018. Worlds-most-traveled-man FoxTV.com article July 16, 2018.
don-parrish-most-travelled-man-favourite-countries Daily Telegraph Interview August 7, 2018. Use buttons above to navigate this site, e.g., Jeffersons evaluation of Washington is in Essays. Enjoy my annual Reviews. There are always new Trip Reports. Check out Favorites. See me photographed with famous people. Visit Family Tree to see 700 of my ancestors and 90 Presidential or famous cousins. Learn about Scholarship winners. If clicking a photo on this website does not enlarge it, change your browser settings to allow pop-ups. As fate would have it, I was in London on April 8, 2013 when she died. 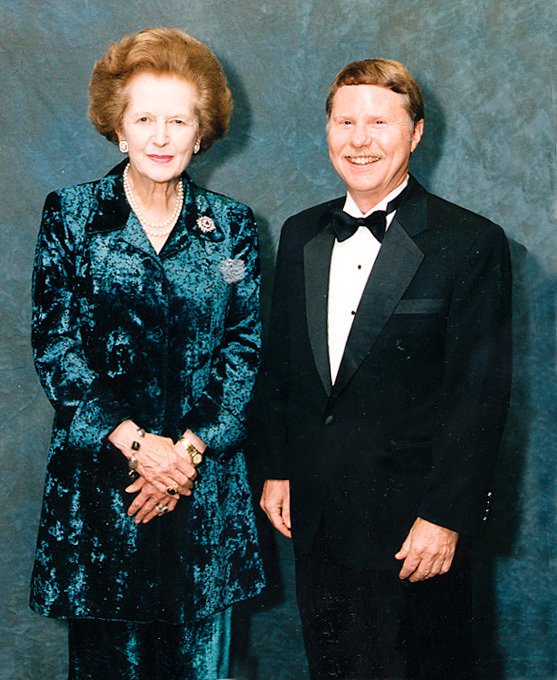 She was a world historic figure who saw the dangers of government control of the economy, and she saved Britain. 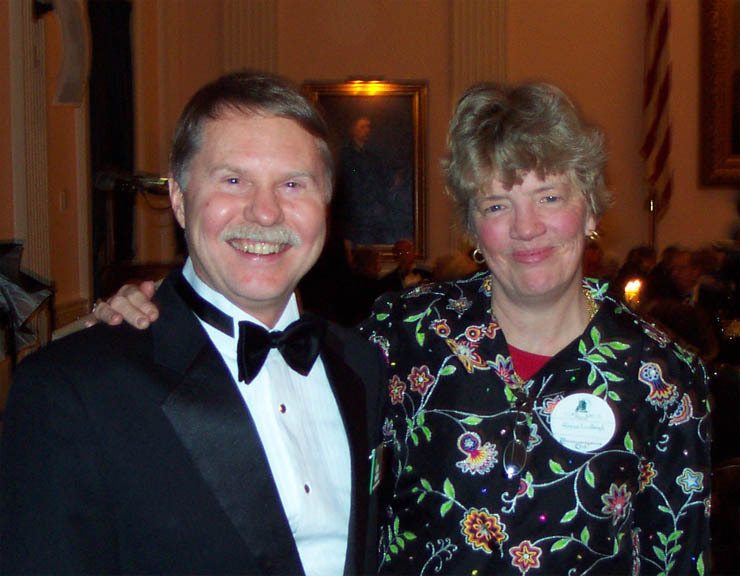 Comments on her by: Steve Forbes, Paul Johnson, NYT Obituary and the Wall Street Journal. 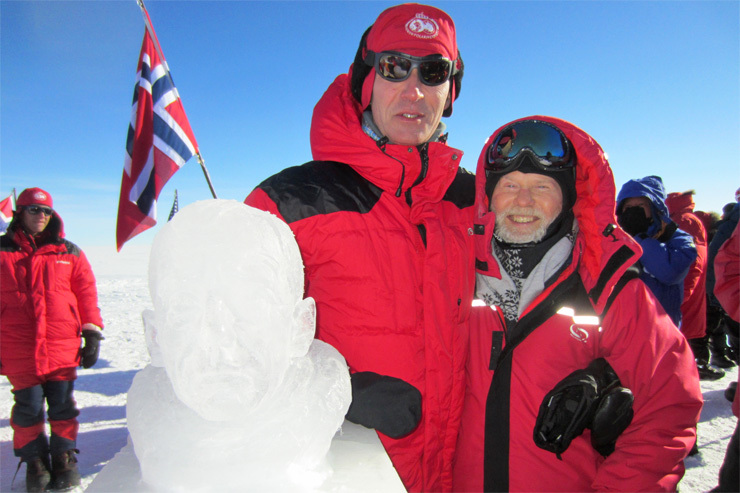 On December 14, 2011 at the South Pole on the 100th anniversary of its discovery by Norwegian Roald Amundsen, I met the Prime Minister of Norway, Jens Stoltenberg after his speech delivered in English. I told him that my grandfather was born in Mosjøen, Norway. I made 100 circumnavigations around the South Pole on its 100th anniversary. Read my report. 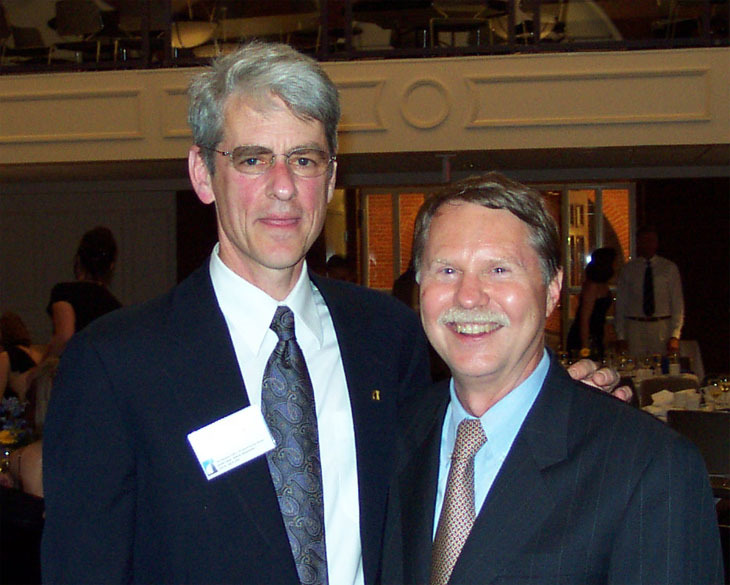 On April 29, 2016 at the Claude Shannon Centennial Conference in Murray Hill, NJ, it was an honor to be photographed with Marcus Weldon, the 13th President of Bell Labs, and the CTO of Nokia. I spent my career working at Bell Labs. It was fortuitous to be one of his guests at this invitation-only conference. Read my conference report. 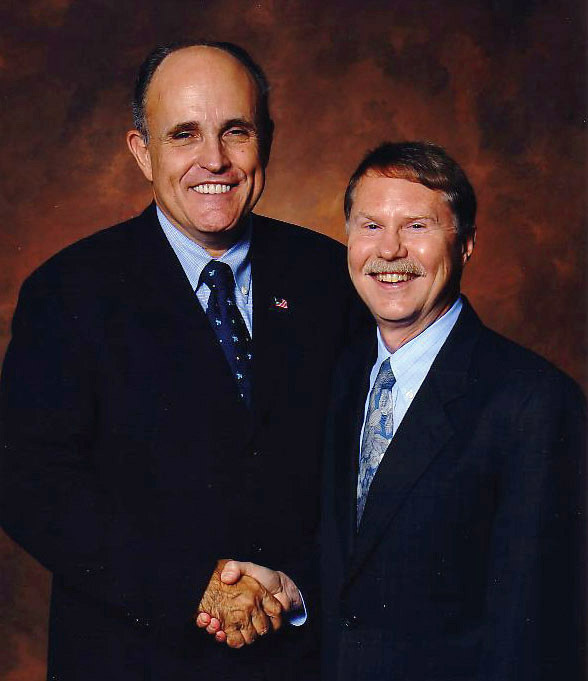 On September 29, 2002, I met Rudy Giuliani before his well-received speech to 2500 people in Lisle, Illinois on leadership. I gave him a map of Manhattan to show him the results of my research to discover the first owner of the land on which the World Trade Center was built. Rudy was eager to learn the name: Jan Jansen Damen. His wife, Ariaentje Cuvilje Vigne my 11 x great grandmother, the Matriarch of New Amsterdam, was the second owner. My research was used by Eric Lipton in his article in the New York Times on June 27, 2004. 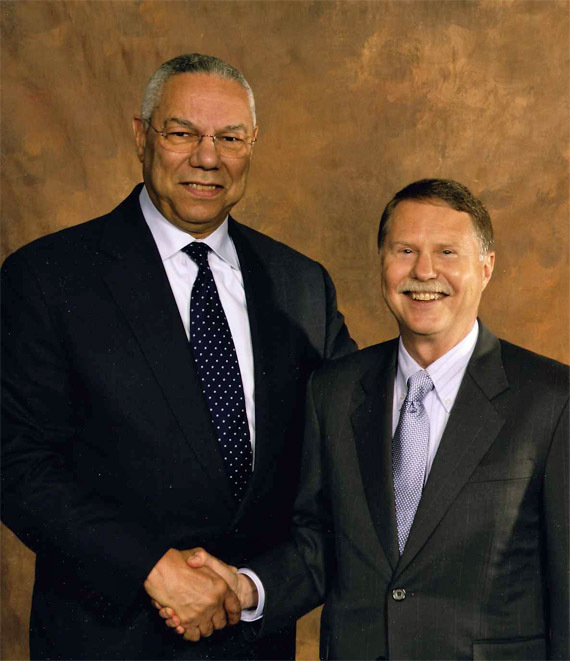 On May 11, 2006, I had the honor to meet former Secretary of State, General Colin Powell before his speech at Benedictine University. General Powell, a hero to this audience, was greeted with a standing ovation. Powell told a series of ancedotes explaining the United States unique power in the world. In this patriotic speech, he quoted the Declaration of Independence at length. During Q & A, General Powell got another standing ovation when he patiently and forcefully corrected an anti-war person who accused him of lying about WMD in Iraq. 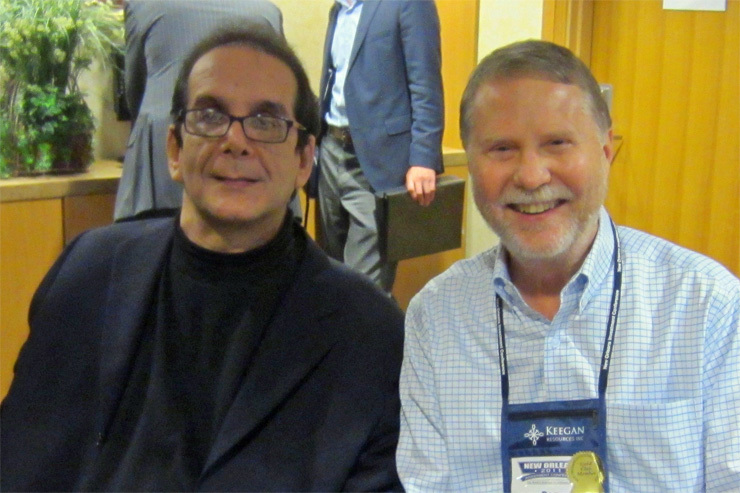 I met Charles Krauthammer on October 28, 2011 in New Orleans after his speech to the Investment Conference. 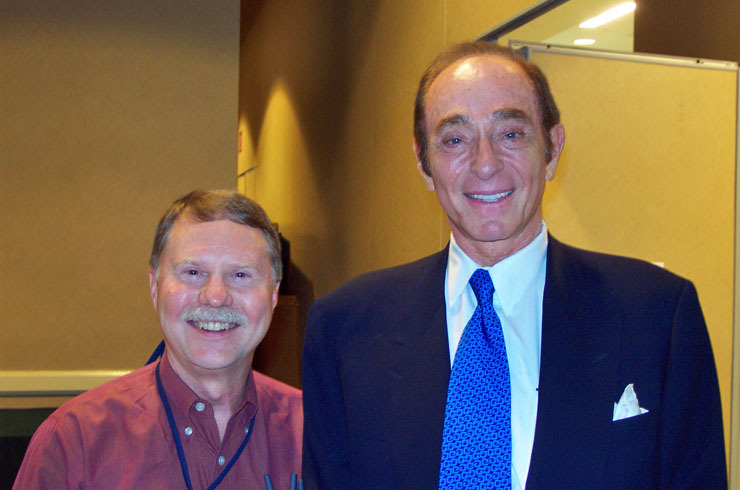 He is very easy to approach and is the same gentleman in person as you see on TV. I had a chance to talk to him a few minutes the next day as well. Dr. Krauthammer is one of my favorite political commentators because he gets to the fundamentals of issues. 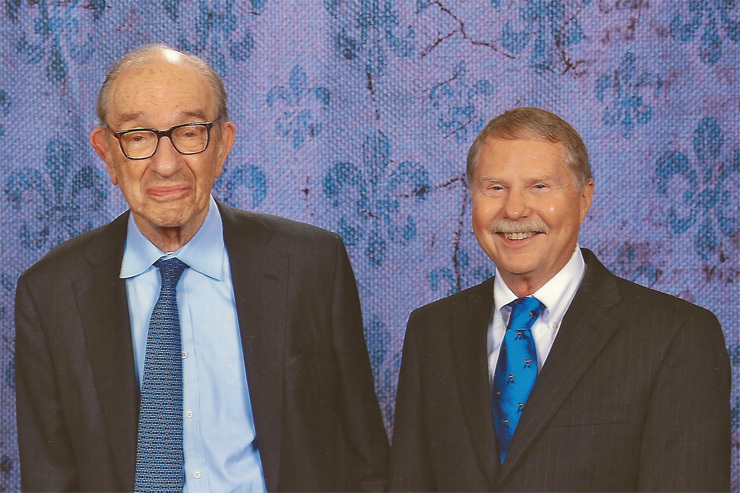 On October 25, 2014, I met briefly Alan Greenspan, the famous former head of the Federal Reserve, at the New Orleans Investment Conference. I mentioned to him that I had met Ayn Rand in 1965 and he responded warmly. Dr. Greenspan is 88 and I was almost 70. He is soft spoken, mentally very sharp, but stooped and a bit unsteady on his feet. 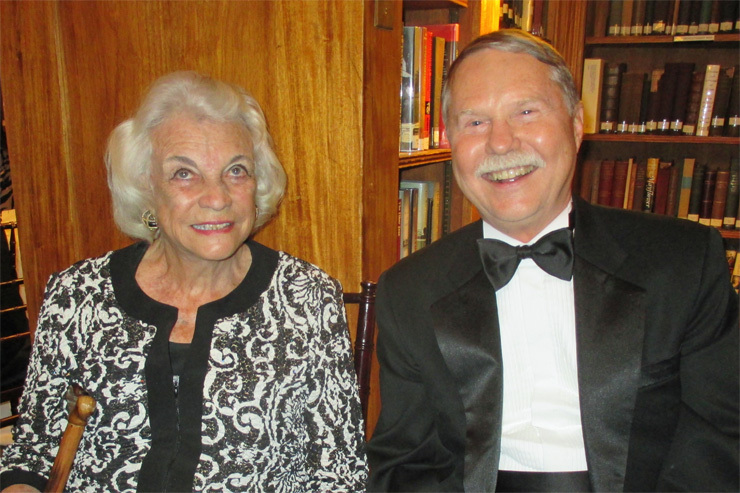 On January 17, 2014, I met Sandra Day O’Connor, the first female justice of the Supreme Court, at the Circumnavigator banquet in NYC. 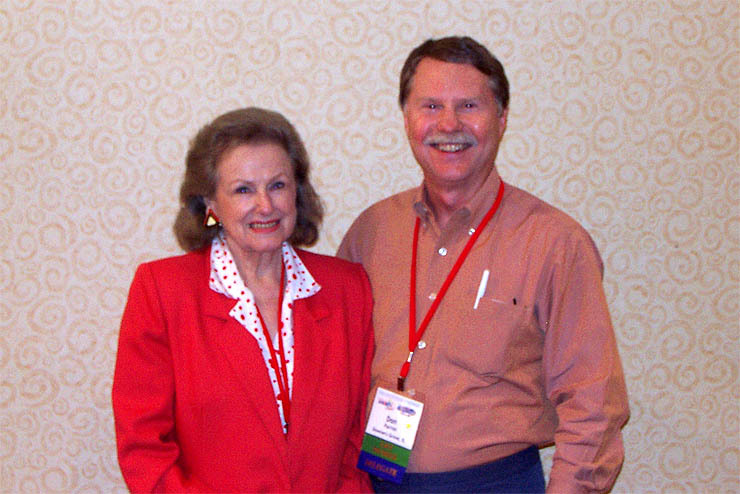 She enjoyed learning that one of my scholarship winners had attended a high school in San Antonio named in her honor. In her speech, she decried the lack of Civics education for young people. 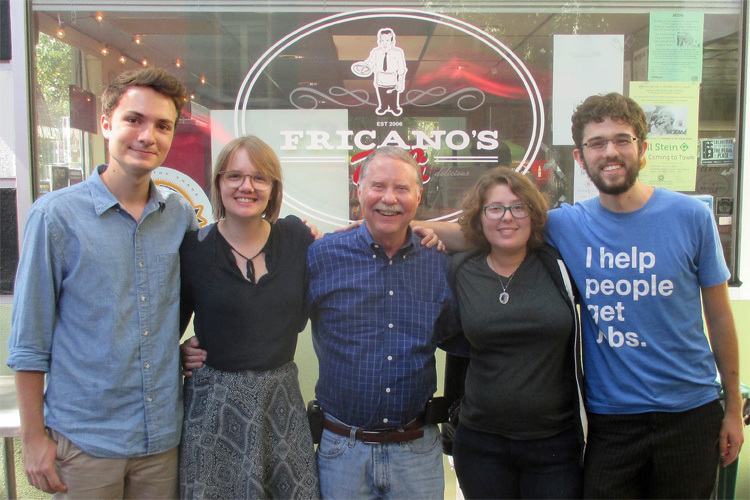 She founded iCivics to help fix it. On October 12, 2016, we had our first luncheon of all Parrish Computer Science winners currently at UT. Info on them and the Scholarship. 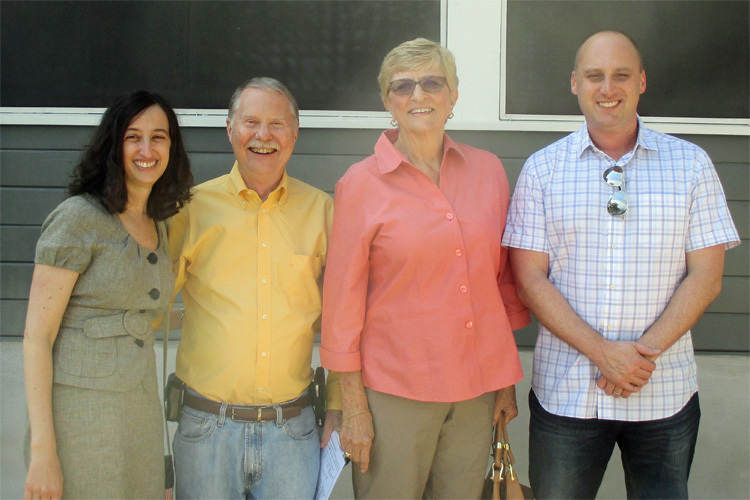 Two days later at the Eastside Cafe, we had the annual luncheon of Scholarship supporters: Tiffany Grady, myself, Eleanor Moore and Doug Roberts. The UT Computer Science Program is now ranked #5 in the World. 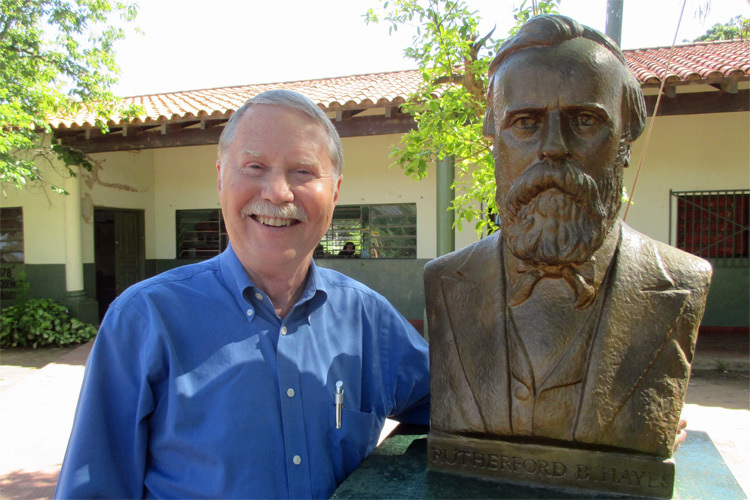 On October 28, 2016 in Villa Hayes, Paraguay, I visited the statue of my distant cousin, President Hayes. In Paraguay, a province, a town, a museum and a soccer team are all named in his honor. Why? In 1878, President Hayes arbitrated the border dispute between Paraguay and Argentina, in favor of Paraguay giving it an area that is 60% of today's Paraguay. 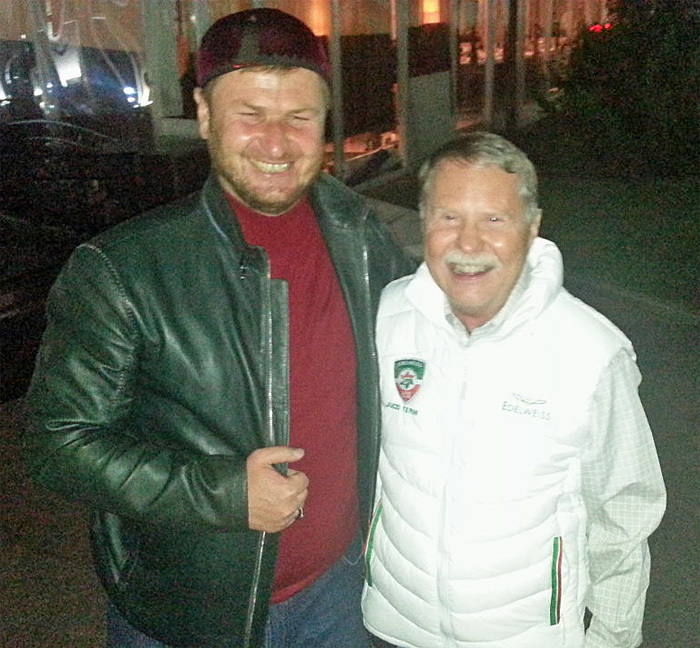 On October 10, 2014 in Grozny, Chechnya, Russia, I had my second meeting with Charles Veley. He is the founder of MostTraveledPeople.com, an Internet Club for extreme travelers. It is the de facto standard for evaluating competitive travelers on how much of our planet they have visited. On November 2, 2013, I surpassed Charles becoming #1 on MTP by visiting my 830th location. On October 10, 2014, I toured Grozny for 4 hours. I was amazed!!! The city is completely rebuilt since the War and there is no graffiti. There is a fun Chicago connection. The Minister of Tourism greeted me as the World's Top Traveler at ETIC. 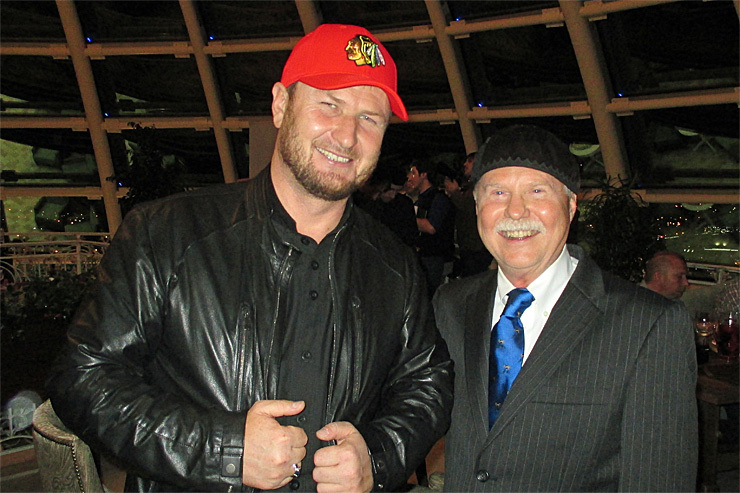 I gave him a Chicago Blackhawk's cap, and he put his cap on my head. The next day he gave me the white vest of the Edelweiss Judo club. 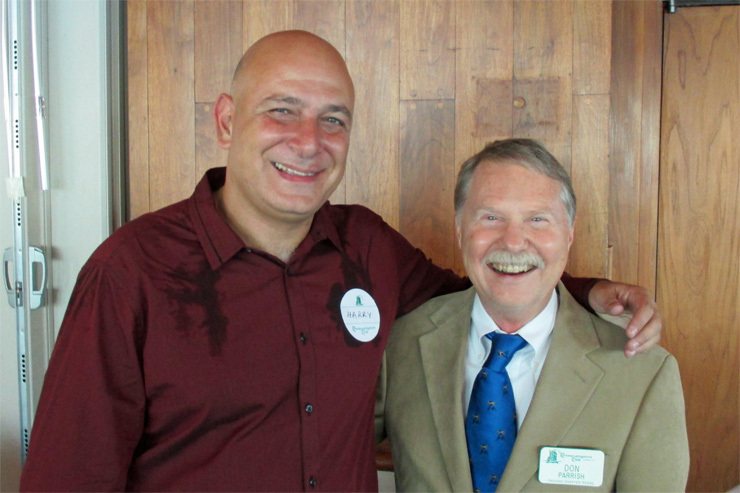 On September 23, 2014, Harry Mitsidis was my guest at a Circumnavigators event at the Chicago Yacht Club. It was a delight to finally meet him in person. 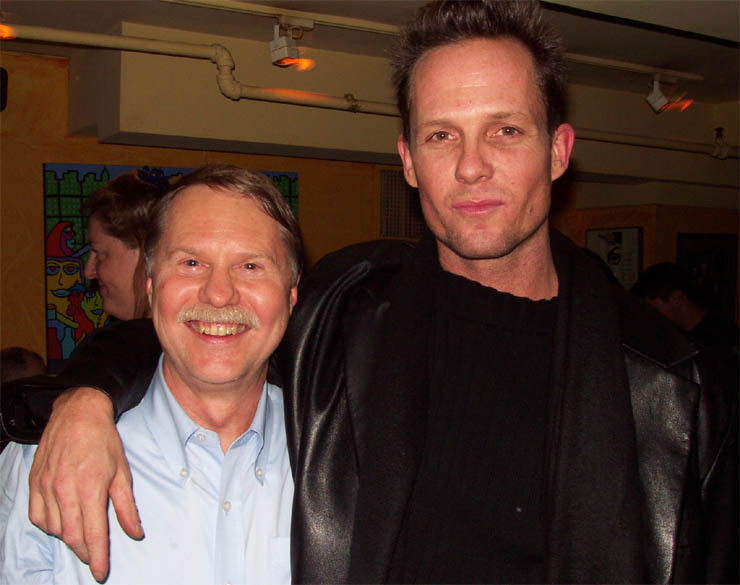 In 2012, Harry recruited me for a travel club he founded now called nomadmania.com (NM). I have been using it in my travel planning. It has an extensive list dividing the Earth into 1281 subregions. 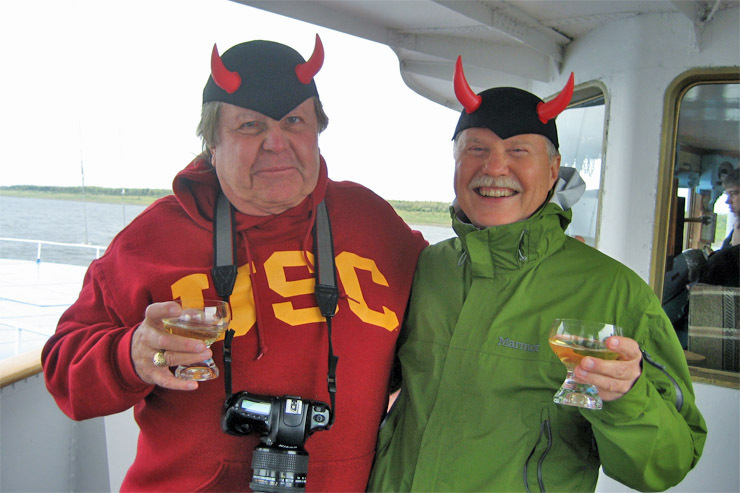 On August 31, 2009, Bill Altaffer, then ranked #2, and I (now #1) crossed the Arctic Circle in Siberia. See Bill's guest trip report. I traveled with Bill & his friends for 18 days as part of my 4 week, 17,000 kilometer visit, all over Russia. This was my 7th visit in 40 years. I was amazed at the progress since my last trip in 2003. 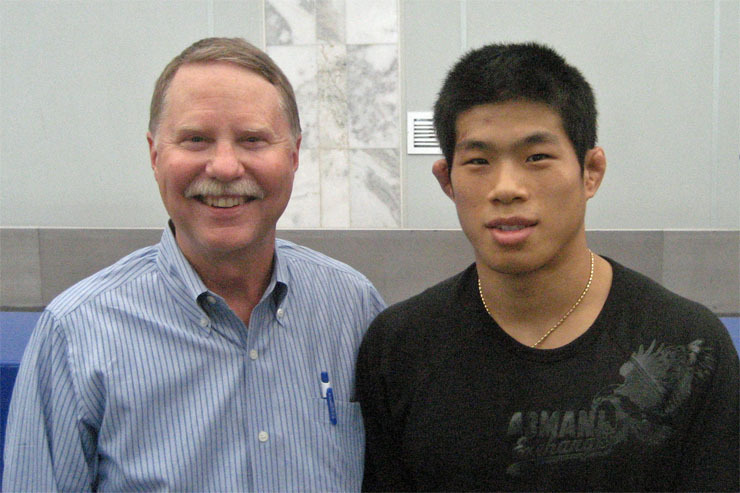 Bill and I visited North Korea in 2005. See my report. 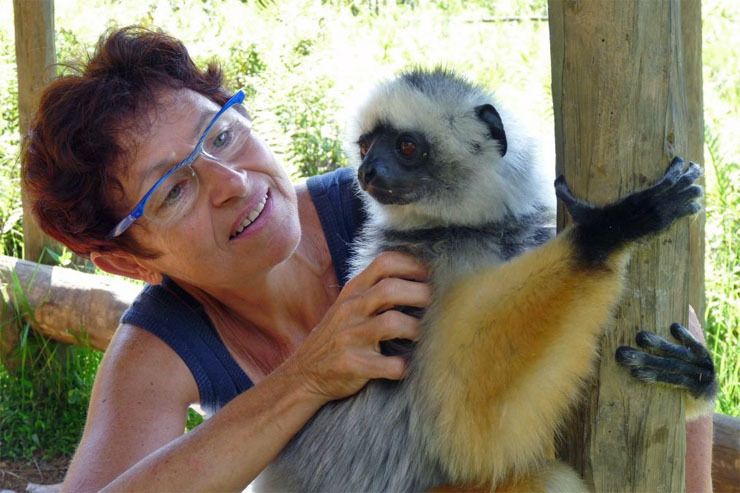 A tale of 3 trips: Catherine Sauvin meets Caramel (info) in Madagascar. Don meets Caramel. 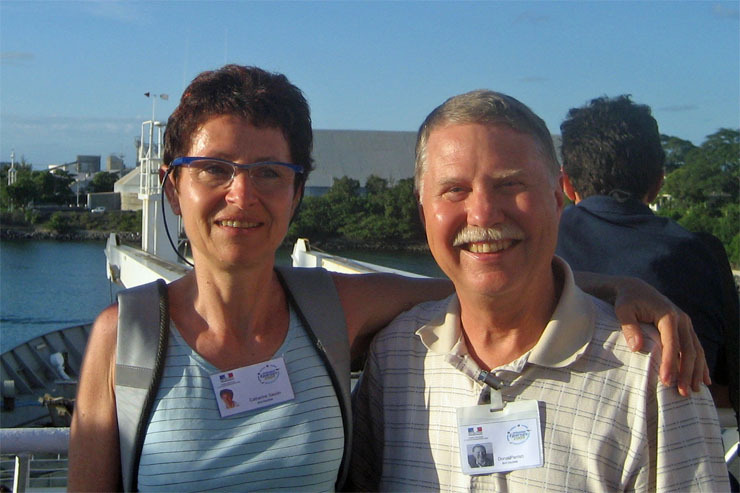 On April 18, 2009 as eco tourists meet on the Marion Dufresne in Réunion for a 4 week voyage to the rarely visited Scattered Islands, Don & Catherine discover they have a lemur in common!! 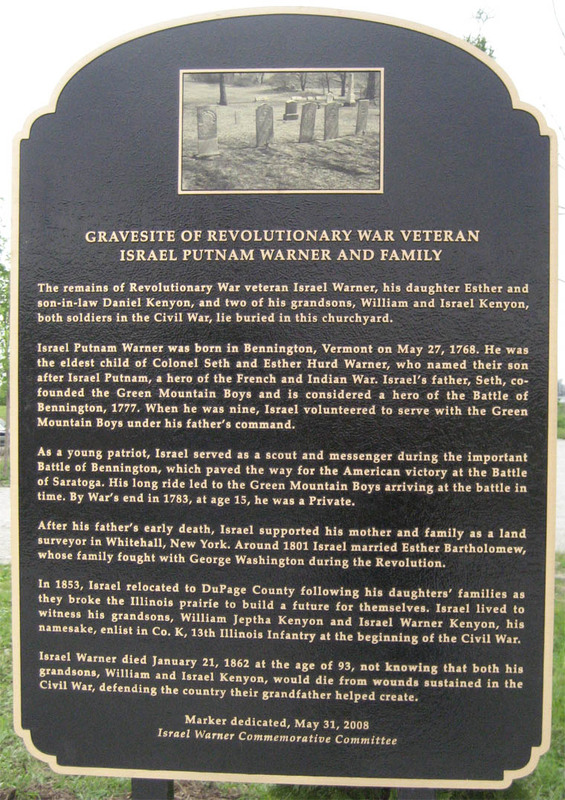 On May 31, 2008, over 300 people attended a ceremony to honor Revolutionary War soldier Israel Warner, the most important 9 year old in the War. He enlisted at 9, served for 6 years and died in 1862 at 93. John Reynolds Jr, playing young Israel, thanked me for locating his grave and chairing the committee that restored his headstone, dedicated 5 new headstones for his family and a historical marker. 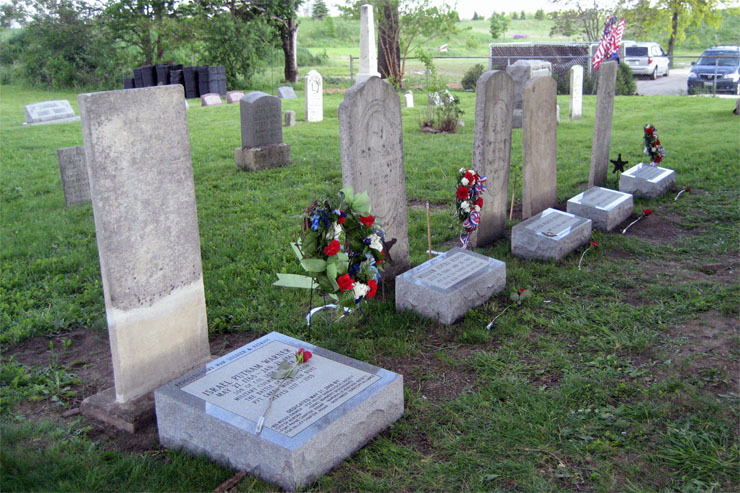 Buried by Israel are both grandsons who lost their lives in the Civil War. 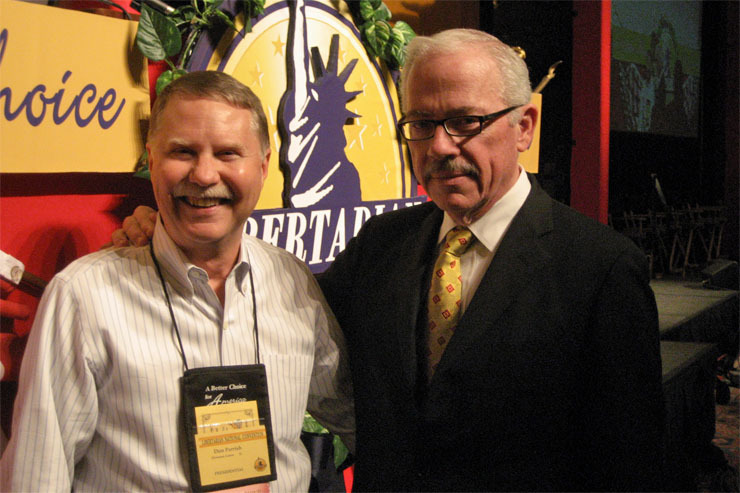 At the Libertarian Party Convention in Denver on May 25, 2008, I encouraged our Presidential candidate Bob Barr and VP Candidate Wayne Allyn Root. Libertarians are the choice of voters who want a smaller, more respectful government. Ron Paul supporters should vote for Barr & Root in November. 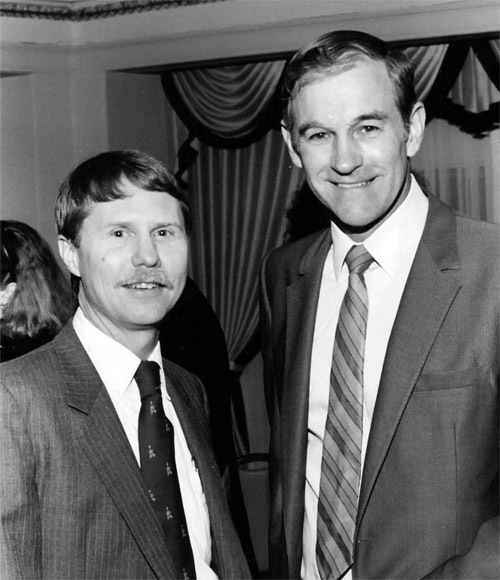 One of my 11th cousins, our common ancestor was Richard Warren on the Mayflower, recently sent me this photo of Texas Congressman Dr. Ron Paul and me taken back in 1988 when he was the Libertarian Party candidate for President. 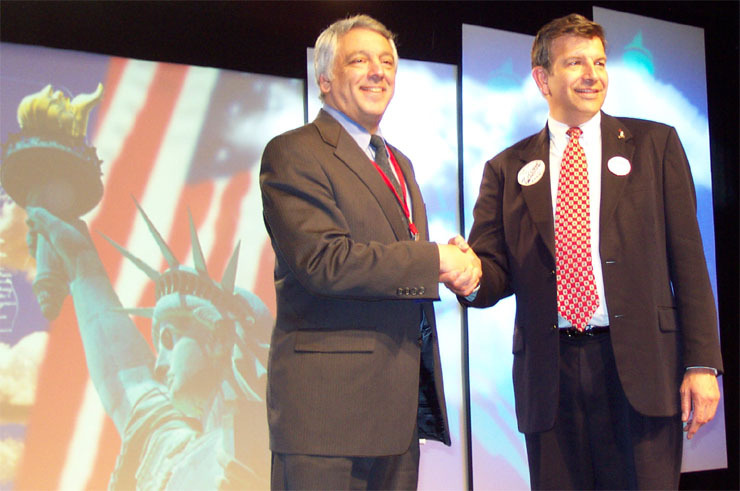 Dr. Paul was a candidate for the Republican nomination for President, but dropped out in June 2008. Even people who supported other candidates in the primaries were deeply impressed with his arguments in favor of libertarian solutions. Dr. Paul has a very strong following on the Internet. 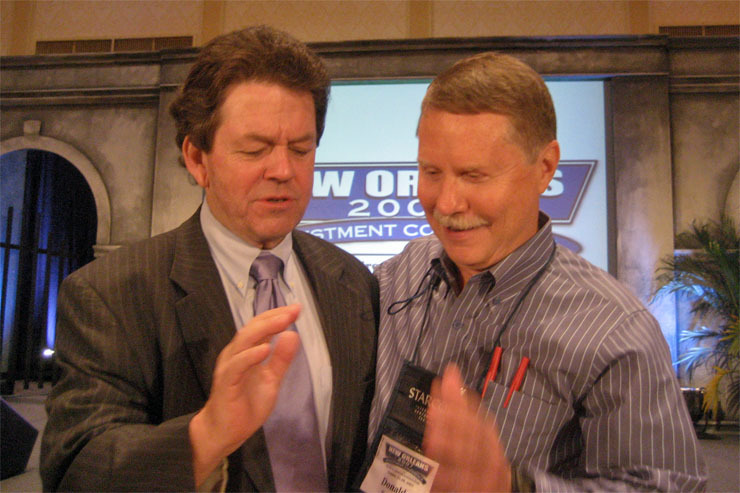 On October 24, 2007 at the New Orleans Conference I thanked famous economist Art Laffer for lowering my taxes. 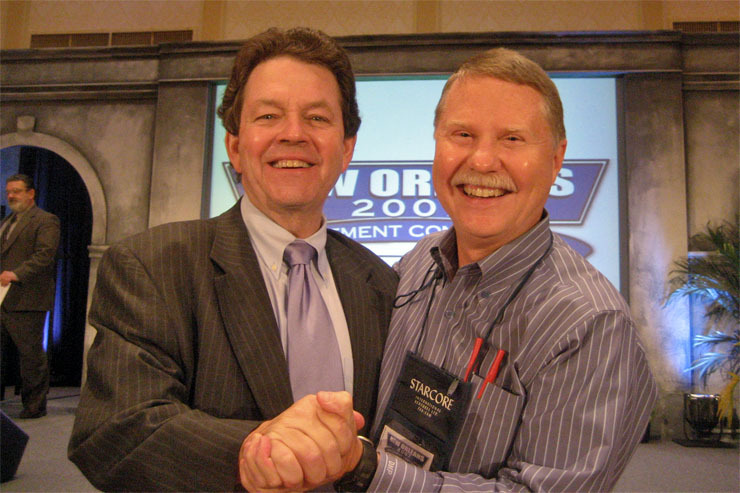 Dr. Laffer gave President Reagan the economic insight that led to the successful fight to lower the top income tax rate from 70% to 28% launching a generation of prosperity in America. 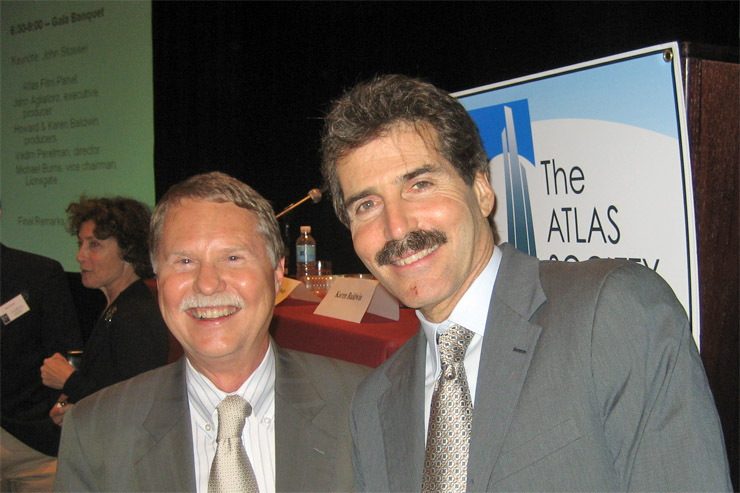 On October 6, 2007 in Washington at the 50th anniversary gala event for Atlas Shrugged, I chatted again with the main speaker and my favorite investigative journalist, John Stossel of ABC News. See my trip report on Rand sites. On April 15, 2011, the long-awaited Atlas Shrugged movie will be released. Follow progress on the unofficial movie site and the official movie site. 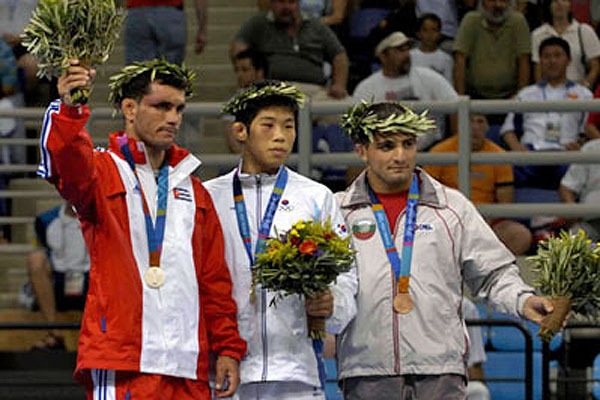 On May 14, 2007, at the airport in Bishkek, Kyrgyzstan during my Central Asian trip, I met Jung Ji-Hyun who won the gold medal in Athens in 2004 in men's 60kg Greco-Roman wrestling by beating the competitor from Cuba. It's unusual to meet someone famous who is exactly my size. It was a delight to be photographed with the beautiful and charming Alexandra Rosenfeld, Miss Europe of 2006 and Miss France of 2006. Photo taken February 25, 2007 at the Meridien Hotel in Brazzaville in the Congo where she and her entourage were also staying. 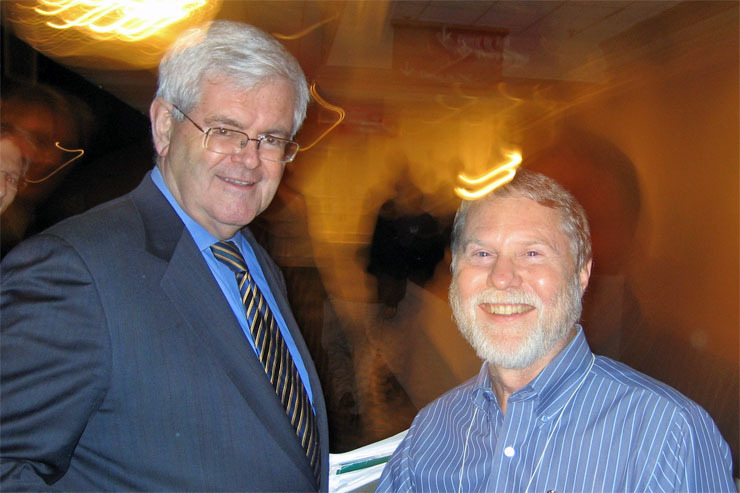 On November 17, 2006, I thanked Newt Gingrich, former Speaker of the U.S. House for his masterful analysis of the world situation delivered to the New Orleans Investment Conference. Newt, a former history professor, can connect the dots effortlessly and convincingly. 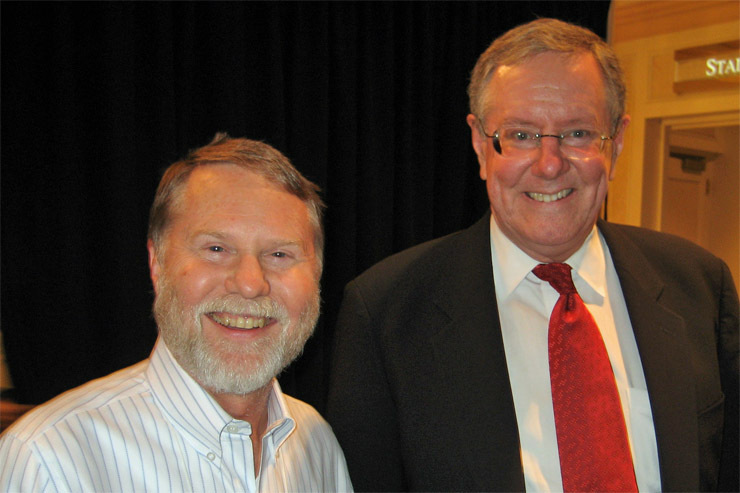 Having read Forbes magazine for 30 years, it was a thrill to meet Steve Forbes after his upbeat talk to the New Orleans Investment Conference on November 18, 2006. 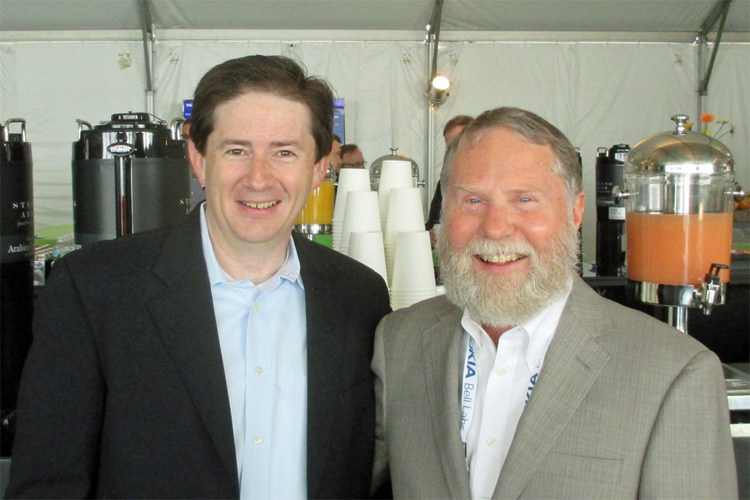 I thanked him for his free-market editorials and for his advocacy of innovative solutions like the flat tax. 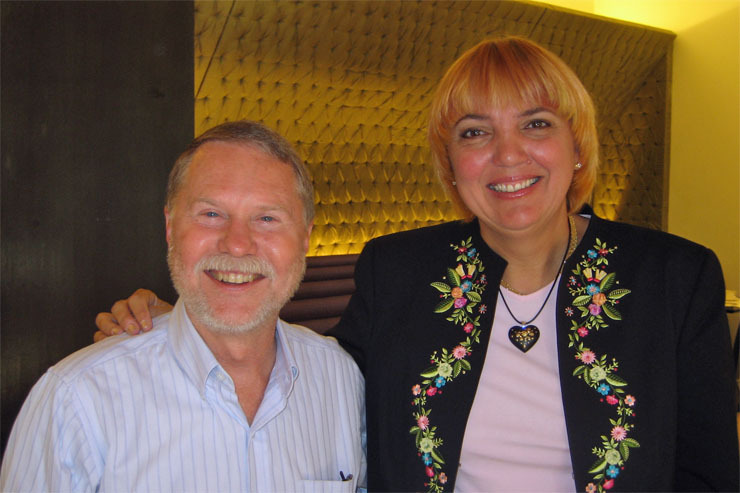 On October 8, 2006 at the Serena hotel in Kabul, Afghanistan, I had a chance encounter with Claudia Roth, former Chair of the Green Party in Germany. I learned that the Afghan Foreign Minister is a former German Green Party member. Read my reports on my Middle East trip. 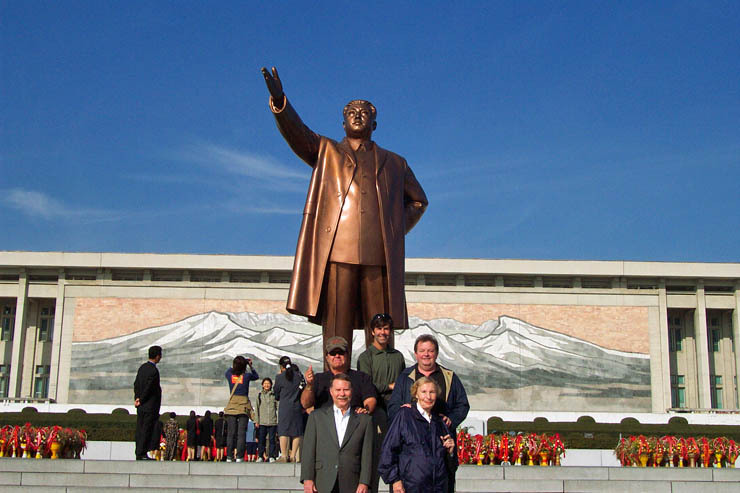 In October 2005, I was in Pyongyang, the capital of North Korea with 4 other members of the Traveler's Century Club. Only 500 Americans have been allowed to visit North Korea in the past 20 years. Read my insightful trip reports to learn about North Korea and Arirang. 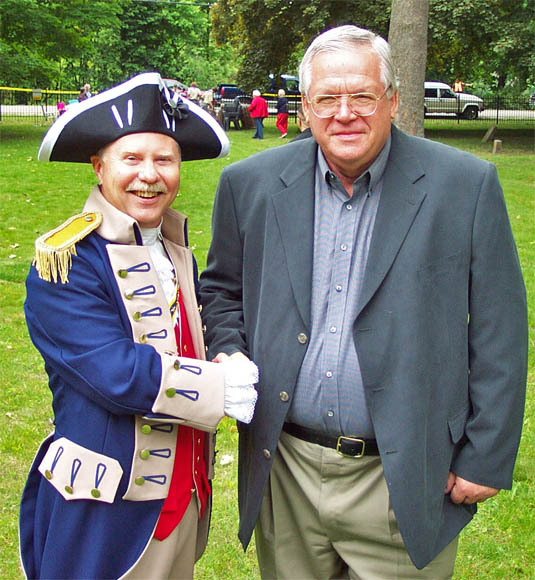 On May 28, 2005, as President of the Fox Valley Chapter, Sons of the American Revolution, I thanked Speaker of the U.S. House Dennis Hastert for his heart-felt speech at the the 250th anniversary of the birth of Daniel Burroughs, a soldier in the American Revolution who fought at Saratoga. 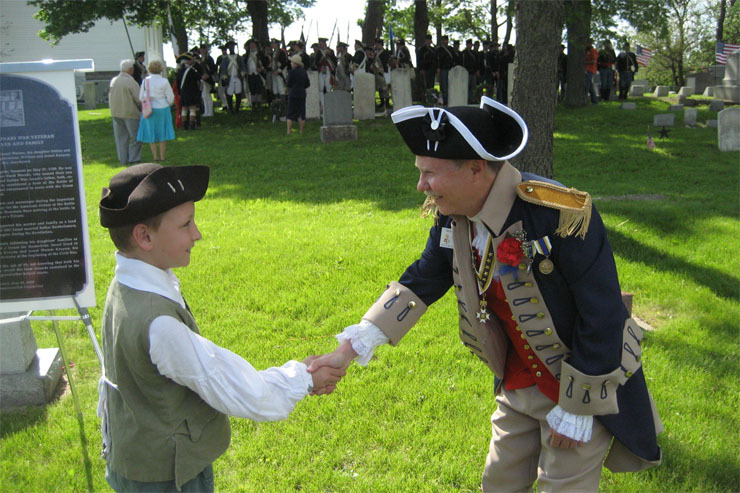 The memorable ceremony at the Griswold cemetery in Plano, Illinois was an extraordinary patriotic event that will be long remembered by all 300 attendees. 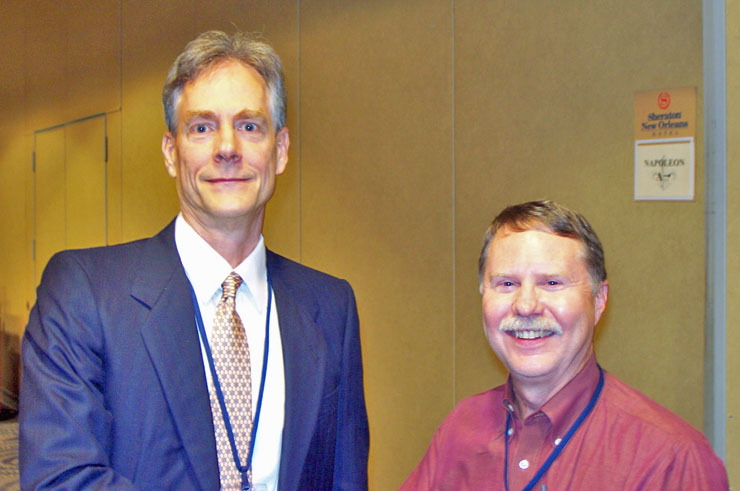 On November 13, 2004, at the New Orleans Investment Conference, I spoke again with two legends of financial forecasting Jim Dines of the Dines Letter and Bob Prechter of Elliott Wave. I admire both of these gentlemen. I've subscribed to their publications for many years. 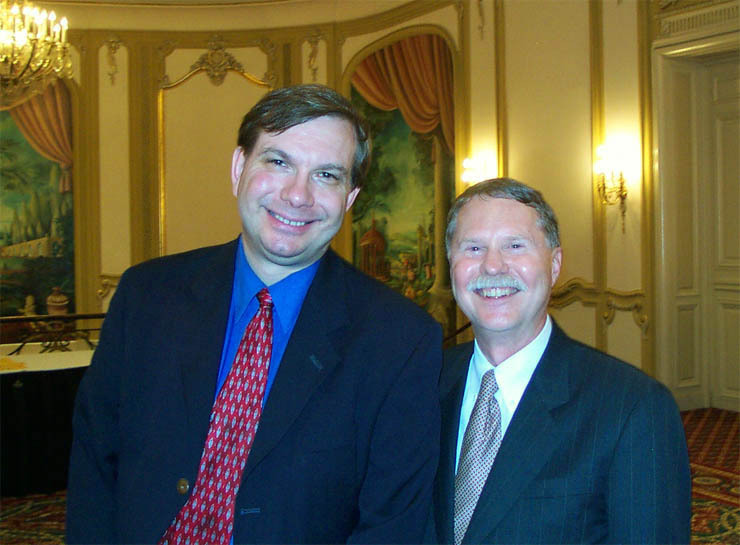 On September 23, 2004, at the banquet celebrating the 20th anniversary of the free market think tank, the Heartland Institute, I was photographed with one of my favorite journalists, John Fund of the Wall Street Journal and old friend Scott Hodge, President of the Tax Foundation. I talked to many old friends among the 640 attendees. On July 23, 2004, my friend John Lewin and I had a grand adventure on a segway touring Chicago's lake front using CitySegwayTours. In the background is the famous Willis Tower. This is a fantastic 3 hour tour including effective segway training that starts at the Adler Planetarium and goes to the new Millennium Park. 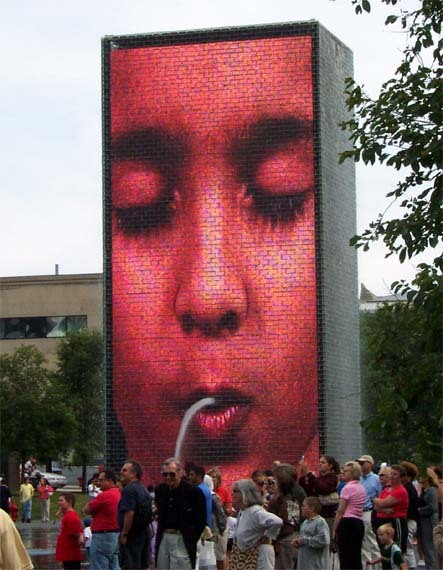 The fountain towers at the $470M park are also a high tech wonder. 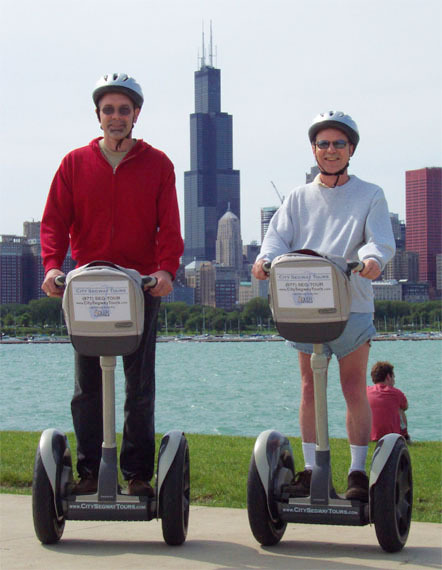 Chicago is a great place to try segway! See more photos and my report. 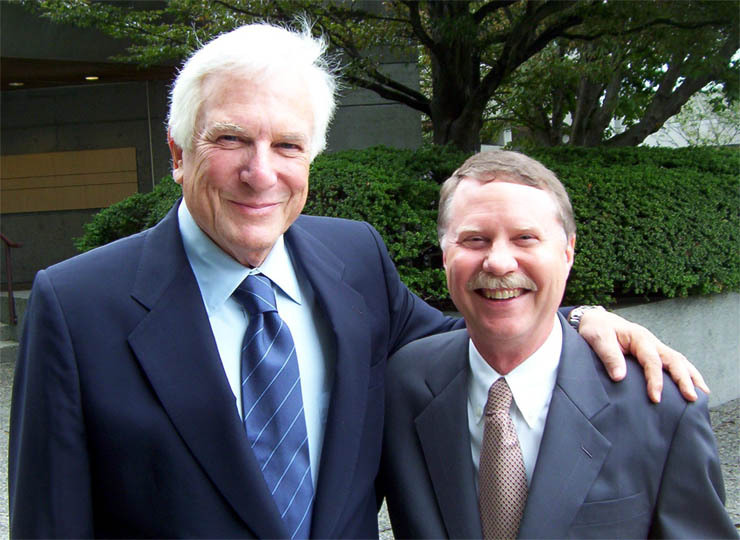 On July 9, 2004 in Vancouver at Atlas Society summer seminar, I chatted with Nathaniel Branden. Ayn Rand dedicated Atlas Shrugged to him and her husband. I met all 3 of them for the first time in New York in 1965. Mr. Branden is well known for books on self-esteem. I've attended his talks dozens of times; he sat next to me at the Ayn Rand stamp ceremony in 1999. 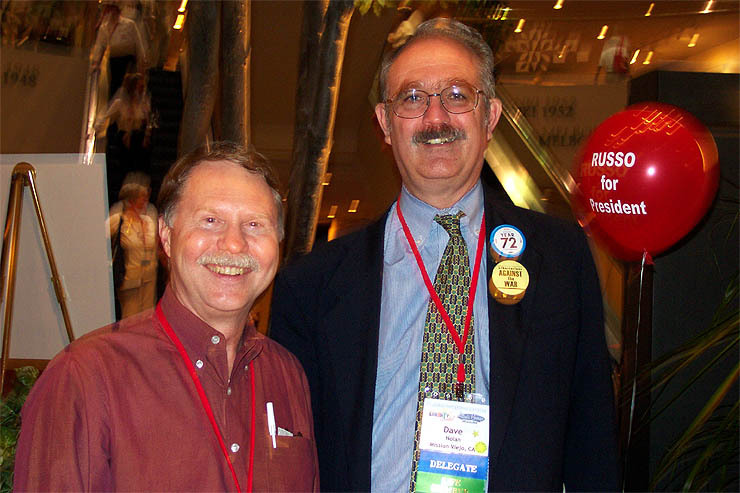 On May 30, 2004 at the Libertarian Party convention in Atlanta, Michael Badnarik was selected to head our ticket with Richard Campagna as VP. 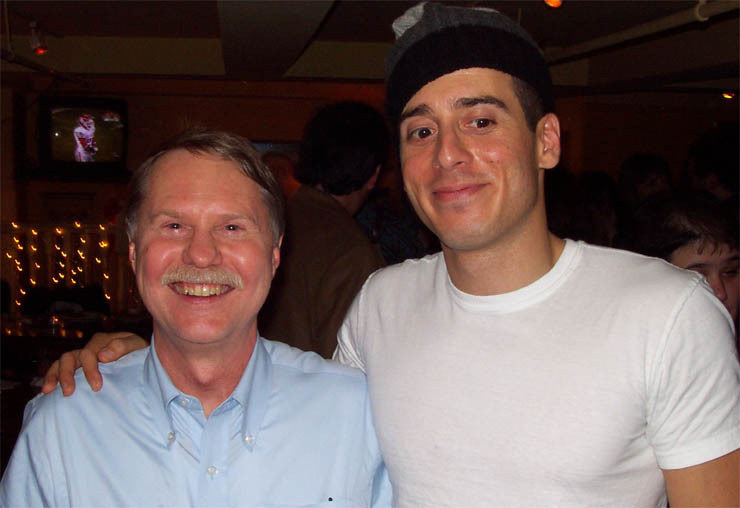 I talked to old and famous friends, David Nolan and Tonie Nathan. 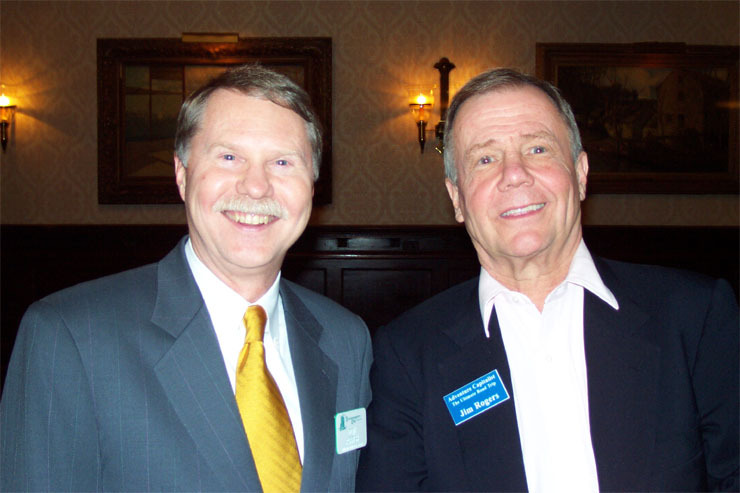 On March 17, 2004 in Chicago, I had the pleasure to chat with Jim Rogers again. Jim is a benevolent and charming person as well as a legendary investor. 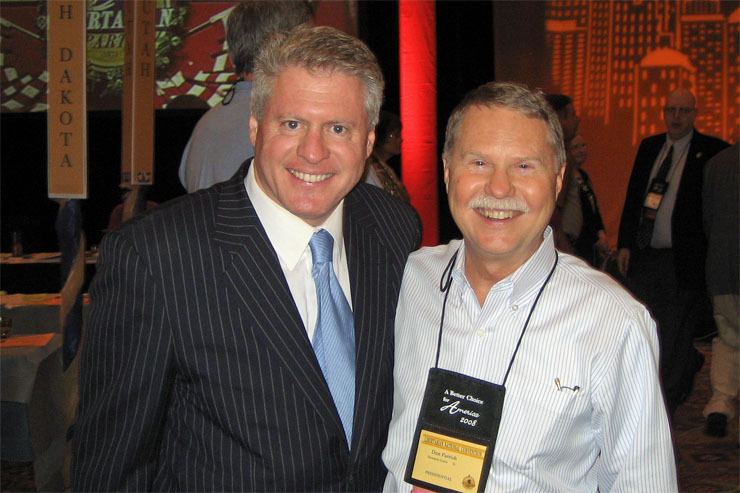 He is the author of Investment Biker and Adventure Capitalist. His latest adventure was a 3-year drive around the world thru 116 countries. It's always educational and fun to hear his insights! 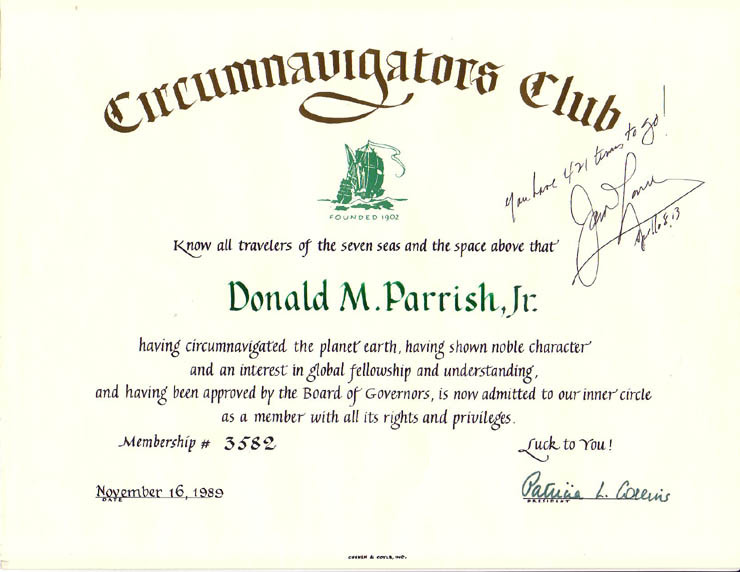 On January 23, 2004, I was elected to Life Membership in the Circumnavigators Club. My 1989 membership certificate was autographed by Astronaut James Lovell of Apollo 8 & 13 fame who noted I had 421 times to go around the world to catch up to him. So far I've made 3 circumnavigations. I'm Treasurer of the Chicago chapter. I visited Star City in 2003. 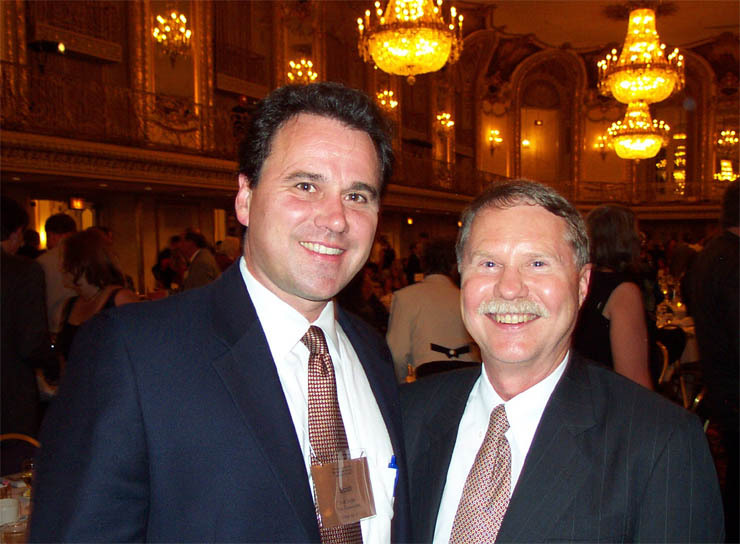 On July 4, 2003, I congratulated David Kelley, Founder and Executive Director of The Atlas Society on another fantastic summer seminar. Summer seminars are week-long educational events on the philosophy and culture of Objectivism held on college campuses. The week is also devoted to analyses of current events, history, art, etc. It is also an opportunity to get into extended discussions with some very insightful and benevolent people. 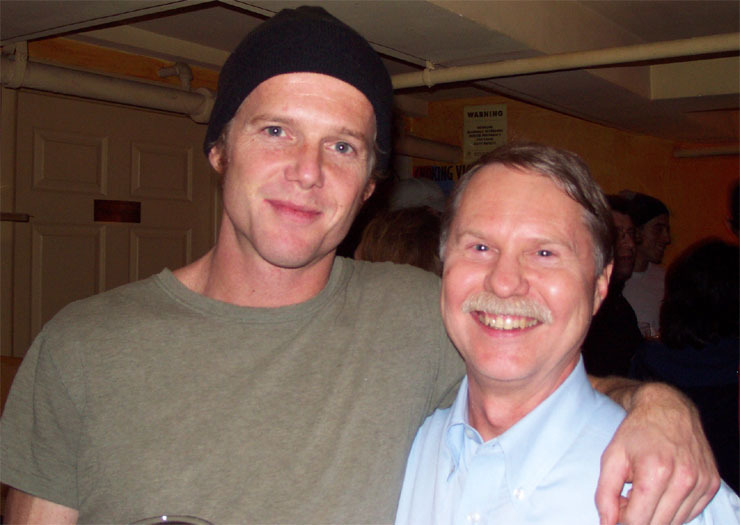 On December 6, 2002, I met Reeve Lindbergh after her talk to the Centennial Celebration of the Circumnavigators Club in New York City. President Bush and Governor Pataki sent congratulatory letters. Reeve is the daughter of Charles Lindbergh. She was delighted to learn that in 1995 I had visited her father's grave located in a remote part of Maui. 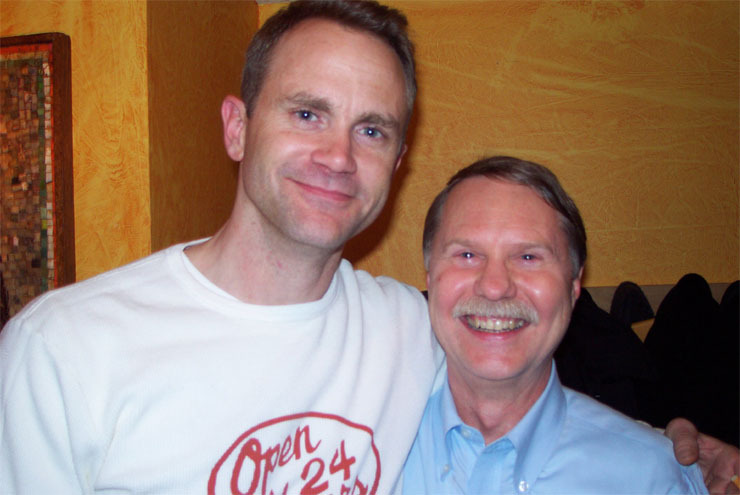 On December 7, 2002, I met Lee Tergesen who plays "Beecher", my favorite character on the HBO award winning series OZ. I met other members of the OZ cast "Cyril", his brother "O'Reilly", the "Poet" and "Alvarez". 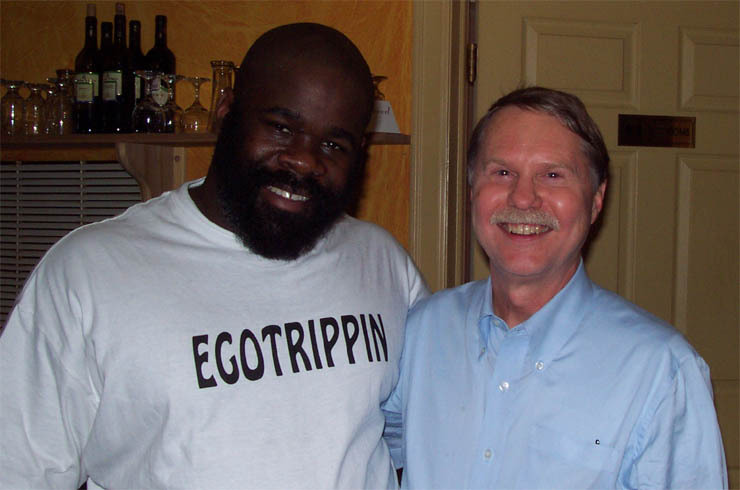 Lee introduced me to Tom Fontana, the genius who created OZ, a complex and intensely graphic adult prison drama. 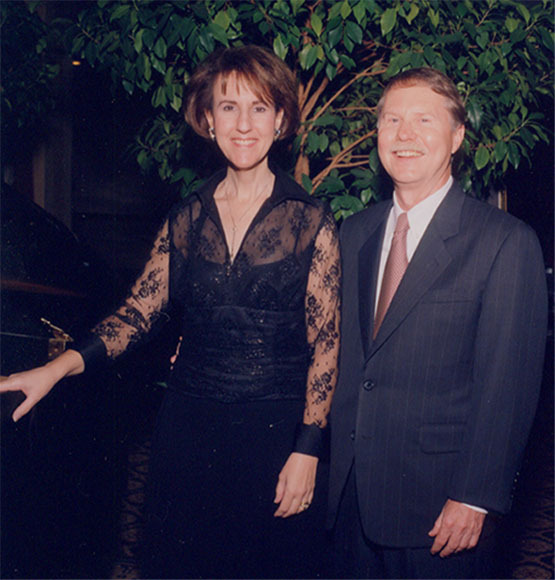 On October 12, 2002, I met former U.S. Trade Rep Ambassador Charlene Barshefsky during her niece's wedding reception in Naperville, Illinois. I worked with her brother Al Barshefsky for many years and had carefully followed her public career. Although a member of Clinton's cabinet, Charlene is a hero to this libertarian for her countless successes in removing trade barriers and enhancing free trade. She is one of those rare individuals who have changed history for the better. 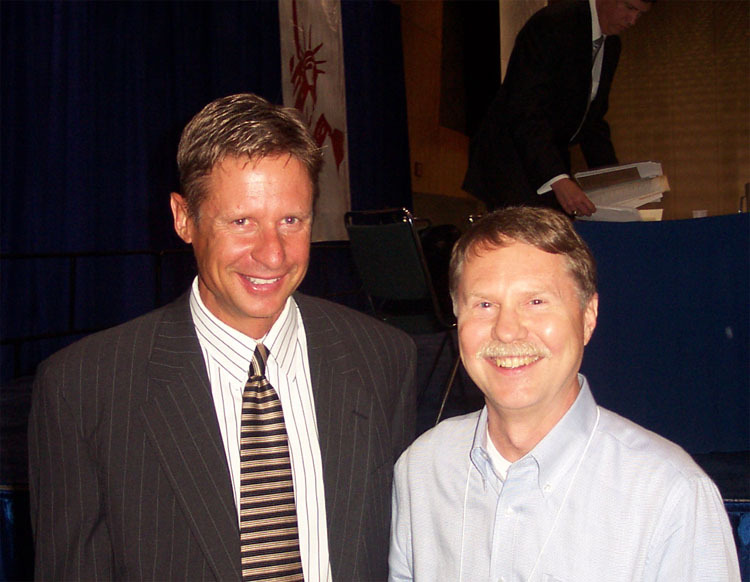 On July 5, 2002, I congratulated New Mexico Governor Gary Johnson on his stunning speech to the Libertarian Party. 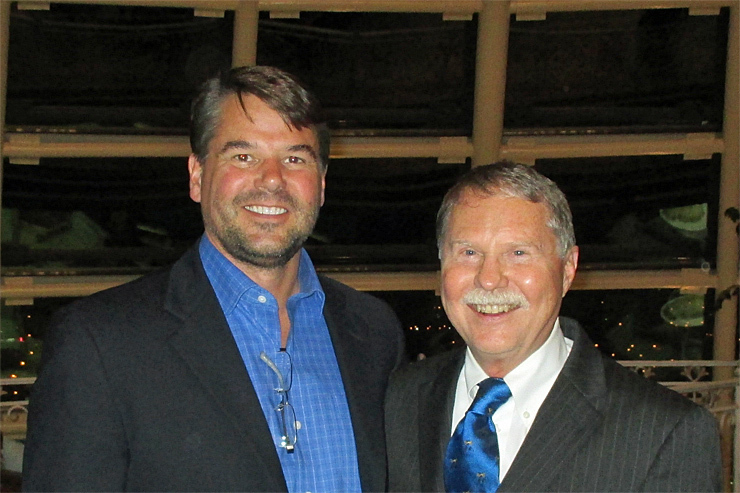 Gary is an ironman triathlete, a brilliant executive and a practicing libertarian. He vetoed over 750 bills to stop all	tax increases, protect individual rights and reduce the number of state employees. In 2016, he was the Libertarian Party's Presidential candidate. Here is a sampling of some of my favorites. There are more in the Favorites section. Favorite Novel: Atlas Shrugged - I spoke to Ayn Rand in 1965. Her Draw My Life video & grave. Admirers of Ayn Rand and her novels can find like-minded others at Ayn Rand Admirers on the internet. For more information on Objectivism, check out What is Objectivism or the whole Logical Structure of Objectivism. If you would like to contact me, my e-mail address is: parrish@prodigy.net. Even better, you can select the Feedback button above in the main navigation and quickly share some of your comments and suggestions.